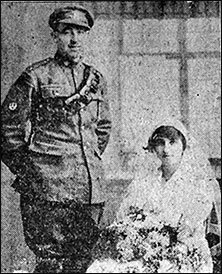 A very pretty and interesting wedding was solemnised at the Irchester Parish church on Saturday, the contracting parties being Miss Eleanor Robbins of Irchester and Gunner James Walker, Canadian F.A., and formerly of Rushden. The bride, who is very popular in Irchester, was given away by her cousin, Mr. W. Humphries (Northampton) and was attired in white silk and georgette and wore a bridal veil and wreath of orange blossom and carried a bouquet of white chrysanthemums and maidenhair fen, the gift of the bridegroom. There were four bridesmaids  Miss E. Fairey and Miss E. Streeton, who were attired in pale blue silk and black hats and Miss K. Robins (niece of the bride) and Miss O Humphries (cousin) who were dressed in white silk and had lace mob caps. The bridesmaids had bead necklets and carried floral bouquets, the gifts of the bridegroom. The duties of best man were carried out by Mr. A. Robins (brother of the bride). Many valuable and useful presents were received including: Bridegroom to bride: set of skunk furs; and bride to bridegroom a silver embossed cigarette case. A reception was held by the bride’s mother, Mrs. G. Robins at the Co-operative Hall; where a large number of relatives and friends attended to add their good wishes to the happy couple, who later left for Boston, where a brief honeymoon was spent. Gnr. J. Walker has since returned to France to again take up military duties.